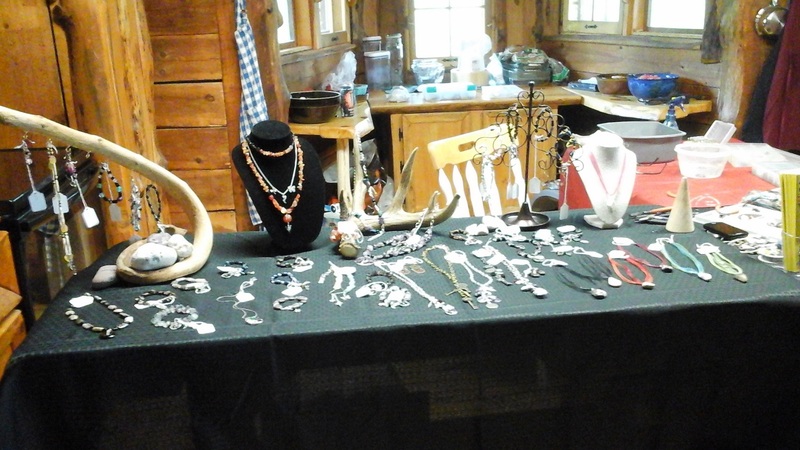 The summer Northwoods Art Tour was held July 24-25-26. As is usual, I use the upcoming event/deadline to do some decluttering, cleaning, and rearranging in the weaving studio, then take a few new photos. I had decided the two largest looms would stay where they were as I didn’t want to ask Char to move the 4-tube fluorescent lights to accommodate changes. When seated at the CM loom I have a nice view out to the lake and pines, not something I want to give up. When seated at the drawloom, not a great view, but two windows right there add nice daylight. The Glimakra Regina was on the (above left) west wall, but we turned it 90 degrees to be on the north wall. One shelf unit was cleared of all yarn and turned into a small loom/equipment storage area. 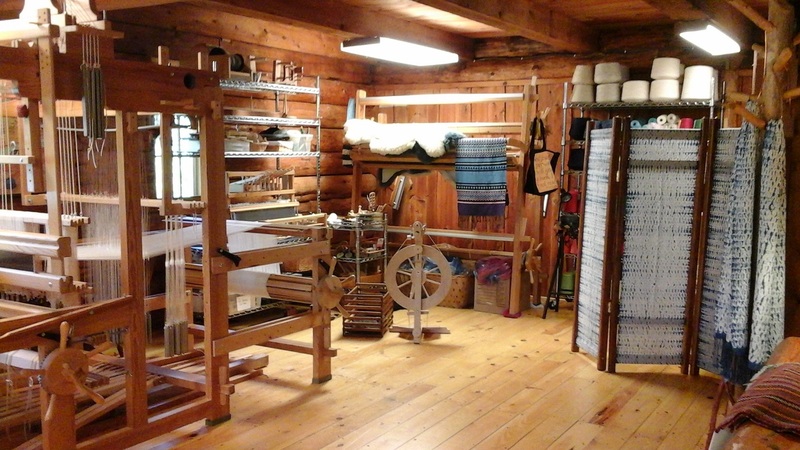 Everything from inkle looms and a table loom to yarn swifts, temples, extra spinning wheel bobbins are stored there, down to my studio tool box. 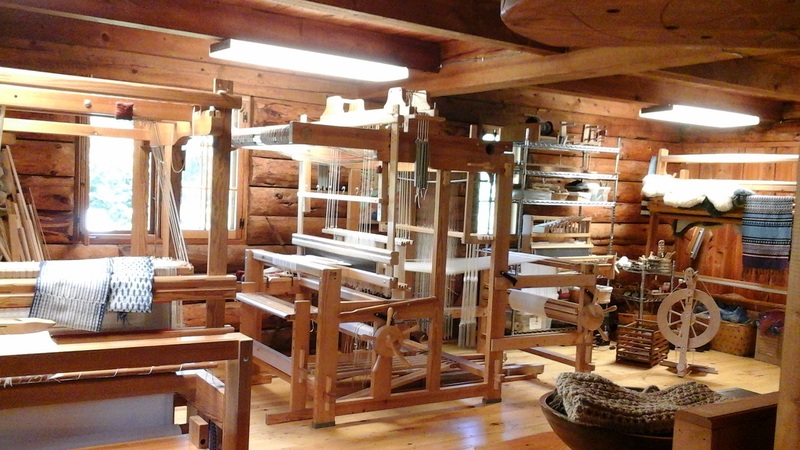 The shelf unit on the right is loaded with weaving and sock-cranking yarns. Other yarns are stored in bins. 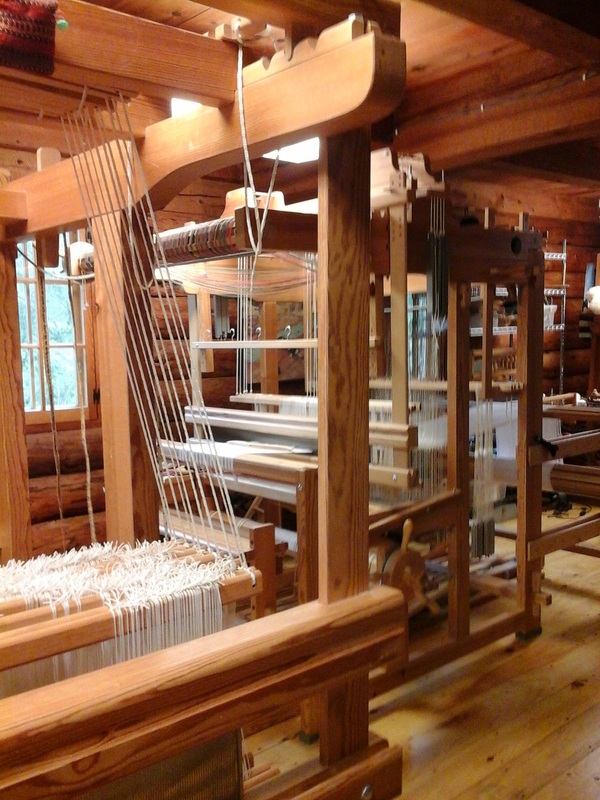 Open floor space was available to demonstrate spinning and/or the 1908 Gearhart sock machine. 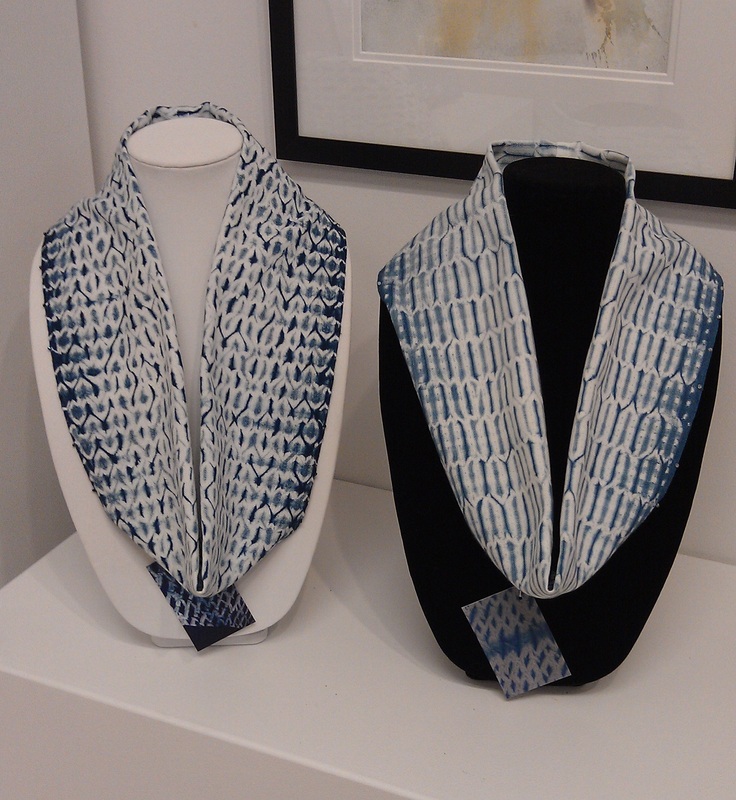 Woven shibori and other weavings were displayed and for sale. 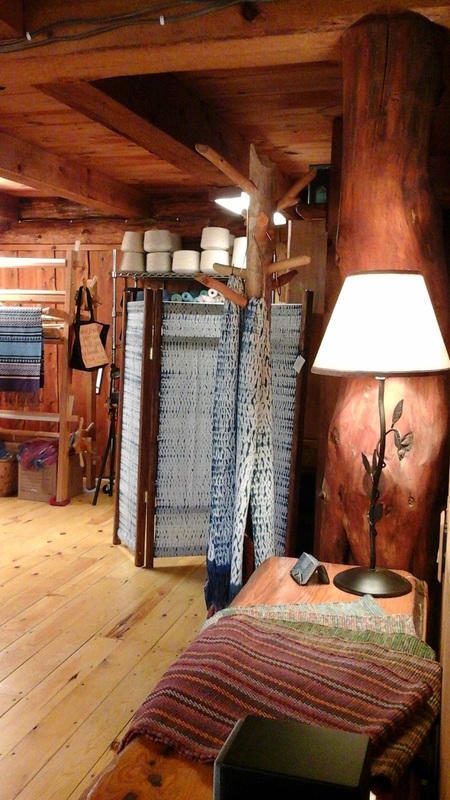 Woven shibori scarves and “rag” (batik) runners were available for purchase. I really enjoyed having the 3 panel woven shibori screen back in the studio for a short time. It is now back at Artistree Gallery, and Char and I are planning a new 5 panel screen. I’ll have a lot of weaving to do! My work table was moved to the south wall, a new electric outlet was added, and the bookcase (slightly visible on left) was moved back to its original position, now housing notebooks filled with Complex Weavers Journals, newsletters, a notebook filled with loom assembly instructions, and more. Sarah Zindel (daughter) was my guest artist. Daughter Sarah Zindel, Celtic Wolf Studio, was my guest artist. 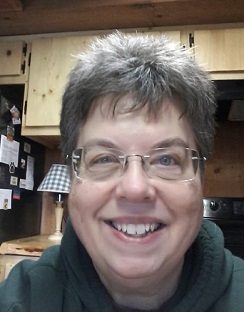 She makes wonderful jewelry, with a particular focus on stones. She did demos and had her jewelry for sale. 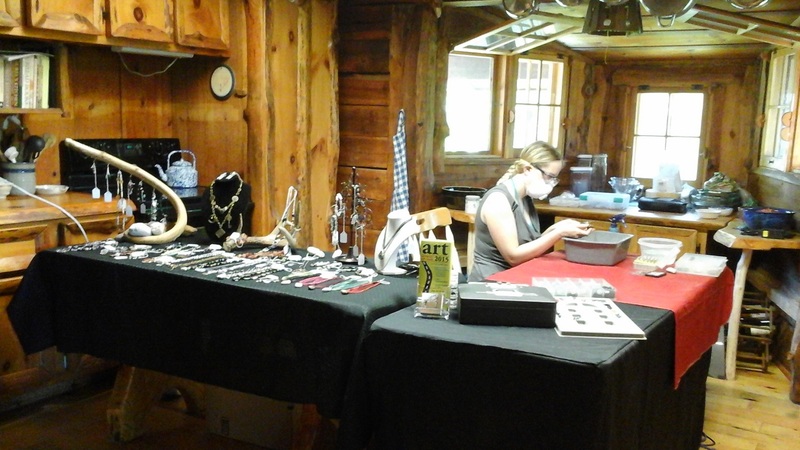 Sarah set up her jewelry and demo area in the kitchen, and visitors really enjoyed her work. Unlike other years, attendance this summer was about one-third the usual number of visitors. Most of the 29 or so artists reported the same thing, as well as lower sales. We are all optimistic, though, that the fall art tour, Oct. 9-10-11, 2015, will bring more visitors to the WI Northwoods and our studios. Northwoods Art Tour banner outside the studio. If you are visiting during the tour, watch for the banners! 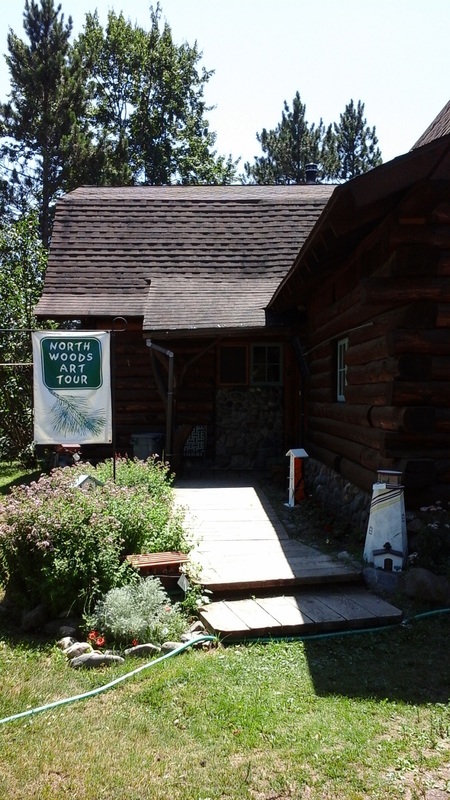 For more information, visit Northwoods Art Tour. 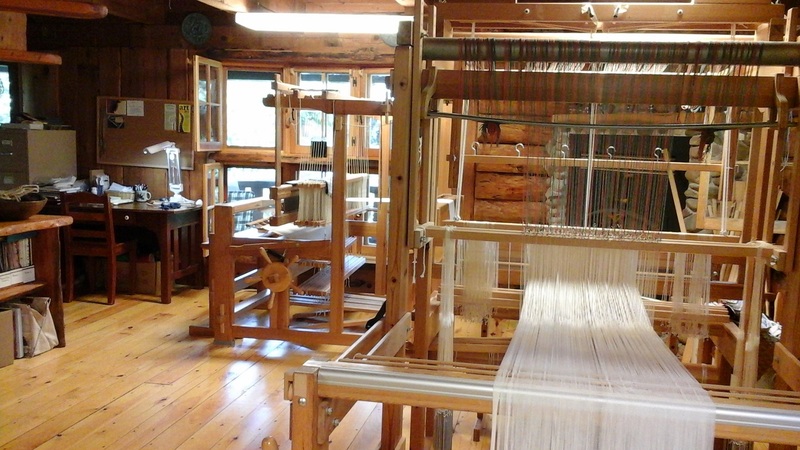 I’ll be returning home Monday evening, and Tuesday begins the weaving/making, and preparations for the fall art tour. There is a lengthy list of things to accomplish! End of summer is nearing, fall weather and autumn color will be here soon. In addition to weaving, we need to cut/split/stack our winter wood which should be dry now. I enjoy this time of the year and look forward to many happy hours at the looms.